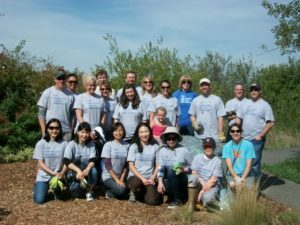 Members of the Magnuson Children’s Garden Committee come from many different backgrounds, ages, professional and personal experiences! Cindy Hazard: Cindy is a longtime Seattle-area landscape designer who got involved in the creation of Magnuson Community Garden in 1999, within a year or two of graduating from the King Co. Master Gardener program. She then co-founded the Children’s Garden Committee in 2001, and led the initial community design charrettes with children and parents that resulted in many of the garden’s main features, such as the Lookout hill and Rolling Lawn, Tide Pool and Bog Gardens, and a selection of a wide variety of interesting-looking and wildlife-attracting plants. In 2004, she led additional design charrettes with children that resulted in the addition of the mosaic Salmon Survival Path and the most iconic feature, the Grey Whale Garden. Cindy chaired the Children’s Garden Committee for its first 10 years, established many of our vital community partnerships, and has happily remained involved in helping to guide the garden’s annual maintenance and development. Here she is in turquoise shirt, at the end of leading a garden stewardship event. Communications Leader Emily Bishton: Emily grew up in a gardening family in the urban Midwest, and arrived in Seattle in 1977. After a 17-year career in home remodeling and restoration, she took time off to volunteer as a school gardening and nature teacher, and to take the 1996 King County Master Gardener training. This all led to 23 years of being a landscape designer and horticulturalist, sustainable gardening teacher, and children’s garden and nature educator. Emily visited the Children’s Garden for the first time in 2003, fell in love with it, jumped at the chance to join the committee, and served as committee chair from 2012-2017. 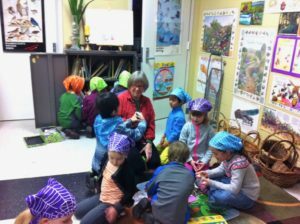 In 2005, she founded the Magnuson Community Center Nature Programs and served as its director and lead educator until retiring in the fall of 2017. She now continues her Children’s Garden volunteering from Arizona during the winter months, including the monthly Magnuson Nature News e-newsletter and SPACE 101.1 FM radio show, and says, “The garden will always be my home, and I look forward to being there with all the visiting kids and families from spring to fall!” Here she is in the Children’s Garden P-Patch plot with a girl scout troop. Community Garden Board Representative Tina Kaempfer: Tina’s childhood included many visits to Sand Point Naval Air Station, where her father was stationed from 1952 until 1962. Decades later, walking through the Children’s Garden created a beautiful surprise when she realized that it had been built in the same area where her father’s work station had been! It also delighted her young granddaughter, who she later enrolled in Magnuson Nature Programs’ summer camps for 8 years. 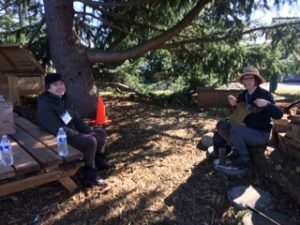 Tina began volunteering in the Children’s Garden in 2006, was a Magnuson Nature Programs docent from 2014-2017, and says, “Many friends and lovely memories have been made here”. She retired in 2014 after 24 years in special education and ELL in the Shoreline School District and now brings her youngest granddaughter with her to the park. 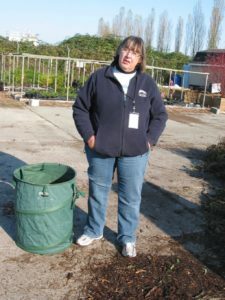 As the Children’s Garden’s representative on the Magnuson Community Garden board, she advocates on its behalf, provides good two-way communication between the two entities, and she takes good care of the worms in our worm bin too! Here she is with kids at a Magnuson Nature Programs summer camp. Refreshments Leader Loie Hanson: Loie grew up in Dubuque, Iowa, in the heart of farm country. Her dad kept a large fruit and vegetable garden, and her two aunts both had huge vegetable, fruit, and flower gardens on their farms and provided fresh arrangements for their church altar. Loie spent many a Saturday and a couple of weeks each summer on the farms, enjoying helping in both of those bountiful gardens. She moved to Seattle in 1970 to be with friends, and has been here ever since, with a long career in nursing. Loie became a King County Master Gardener in 2008, a member of the Magnuson Children’s Garden within two years, and Refreshments Leader in 2017. She also was a volunteer docent with Magnuson Nature Programs for two years, and says, “Now I like to share my love of gardening with my grandchildren as well as with Magnuson Children’s Garden visitors!” Here she is showing new volunteers the “clean green” yard waste area at a fall stewardship event. Carol Furry: Retiring after 20 years as a middle school science teacher in the Seattle Public Schools, Carol was able to continue her interest in teaching children when she discovered Magnuson Nature Programs. She was one of the first Nature Docents, and volunteered for 7 years at camps, classes, field trips, nature walks, and more. She is an expert on aquatic insects and other invertebrates, and made significant contributions to the nature programs curricula throughout that time. Carol joined the Magnuson Children’s Garden Committee in 2017 to continue bringing the word about the environment to children. She is also a volunteer tutor with Literacy Source, likes to read, and says, ” I likes to travel, especially when the goal is bird-watching!”. Here she is with kids at a Magnuson Nature Programs winter break camp. Kelly Angell: Kelly grew up on a farm in Montana, but Seattle has been home for over thirty years. She has been a King Co. Master Gardener since 2012, and immediately started volunteering at the Magnuson Children’s Garden as an intern. Kelly says, “I am so thankful for this wonderful place, where children of all ages can interact with and connect to nature, in so many different ways – things I took for granted as a kid, but have come to value greatly as an adult”. 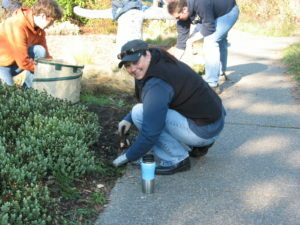 Kelly also helped to plant and maintain the Magnuson Community Center Bird-friendly Landscape and Resource Conservation Landscape projects for several years. 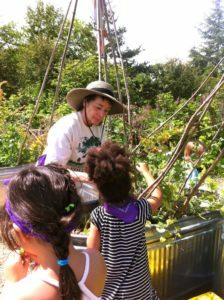 As a member of the Master Gardener Foundation of King County board of directors from 2014-2016, she was also its liaison with the Children’s Garden Committee, and her advocacy was instrumental in securing ongoing funding of the garden. Here she is helping to weed the Grey Whale Garden. P-Patch Co-Leader Joy Naganuma: In 2012, Joy began volunteering in the Children’s Garden and as a docent with Magnuson Nature Programs, and says, “Many years ago, I became a King Co. Master Gardener because I love learning and sharing ways to grow plants with other people. More and more, this has focused on growing edible plants with kids and their families. It’s fun, exciting, and delicious to eat what we grow together too! Also, fresh food from plants is healthy and nutritious!” Here she is with some very dedicated kids at a 2017 stewardship event. 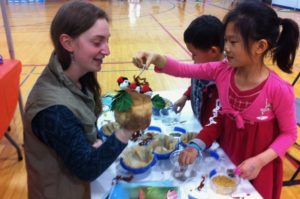 Treasurer Heather Lecrone: Heather is a Seattle native who loves teaching kids about nature and growing fresh organic food, as well as exploring Magnuson Park and taking biking trips around the Pacific Northwest. 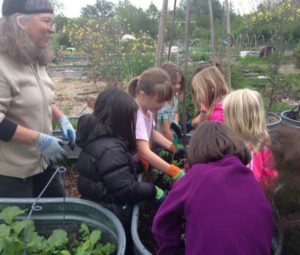 She began volunteering in the Children’s Garden in 2012, became part of the teaching staff of Magnuson Nature Programs in 2016, and joined the Children’s Garden Committee in 2017. She also started and taught a Bicycle Safety Program at Sand Point Elementary for several years. Heather graduated from the UW Community, Environment, and Planning Program in 2018, and soon afterward added to her busy schedule by volunteering to be the committee’s Treasurer. Her organizational skills, spreadsheet expertise, and great ideas are a big asset to the garden’s financial sustainability. 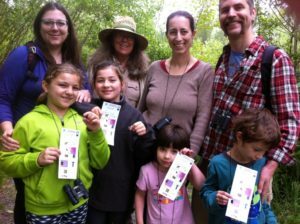 Here is is on left in blue shirt, at one of the Magnuson Nature Programs 2017 wetland walks. P-Patch Co-Leader Debi Quirk: Debi moved to Seattle in 1980 to start graduate school, and fell in love with the Pacific NW. She has been a registered nurse for over 40 years and currently works as a Patient Advocate. She graduated from the King Co. Master Gardener Program in early 2015, and has been involved with the Magnuson Children’s Garden since. Debi also was a volunteer docent with Magnuson Nature Programs for three years, and says, “I love seeing the kids in awe of nature: the birds, frogs, butterflies, dragonflies, beavers, and what grows in the garden, and it has been an amazing experience for me too!” Here she is with kids at a 2017 Magnuson Nature Programs summer camp. 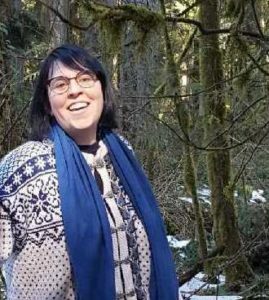 Education Leader Tanya White: Tanya became a Magnuson Nature Programs docent in 2015, the same year she became a King Co. Master Gardener, and over the next 2 years she assisted with many camps, classes, and field trips. She also began using her creative and artistic skills in Children’s Garden projects such as the butterfly-shaped Pollinator Garden and future Sea Turtle climbing structure. In 2017, she joined the Children’s Garden Committee and began to also help teach our Family Garden Classes, complete with wonderful take-home projects for kids and families! Recently, she volunteered to take on the Education Leadership, and is currently working with Emily on transitioning into that role. 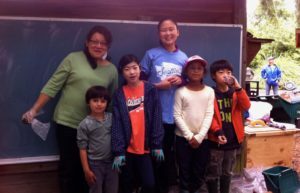 Here she is on the left in green sweater, while leading kids in making mosaic bricks for the Pollinator Garden in 2017. Infrastructure Leader Eric Sladky: Eric graduated from the UW School of Landscape Architecture in 1984, and was an Instructor of Landscape Design at Bellevue Community College from 1985-1996, all the while running his own landscape design and construction business. He joined a Seattle Architecture firm from 1997-2010 as a Landscape Architect, and is currently self-employed and specializing in Design and Development. 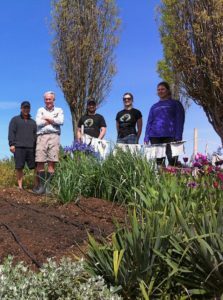 In early 2016, Eric graduated from the King Co. Master Gardener Program and “jumped in” to the Children’s Garden with both feet, volunteering to become Infrastructure Leader only a year later! His irrigation system management and plant care expertise are major elements in the garden’s good health and wise use of resources. Here he is on the left in khaki shorts, at one of our 2017 springtime stewardship events. 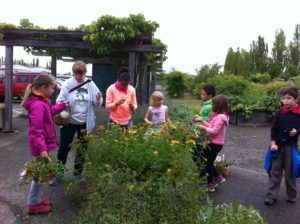 Master Gardener Resources Leader Sandra S: Sandra was a graduate of the 2017 King Co. Master Gardener training, immediately began volunteering in the Children’s Garden that spring, and joined the Children’s Garden Committee that summer. Recently, she has also “jumped in” to manage and enhance the new resource materials that we’ve received from the Master Gardener Foundation, which will make it easy for all committee members to provide garden advice and information to all attendees of our Family Garden Days, classes, and stewardship events! Here she is on the right, taking a well-deserved break at a springtime stewardship event! Sarah Heater: Sarah joined the staff of Magnuson Nature Programs in the spring of 2017, and was a tremendous asset to all its programs. In the fall of 2017, she joined the Children’s Garden Committee, and has continued making creative and concrete contributions ever since, even though she now is living in the Bay Area and in an intensive grad school program! Here she is at the 2017 Magnuson Nature Programs’ Celebrate Urban Nature event, teaching kids about how bird bills are adapted to match their diet. Sarah Winkowski: Sarah made her way to Seattle from Virginia, looking for new experiences and in pursuit of a degree in museum studies. With a background in wildlife conservation, she feels deeply about the significance of providing others the opportunity to connect to and become curious about nature. She says, “As a child, I spent countless hours in the woods. The leaves, the trees, the soil, and the creatures I found there were endlessly fascinating to me. As a young adult, being out in nature helped me to find a sense of calm and mindful focus. As an undergraduate, I felt rootless until I found a program where I could continue to explore my captivation with the natural world, where entire classes were spent outdoors in the soft slopes of the Appalachian Mountains learning to listen to the birds and to read the twigs of the trees”. 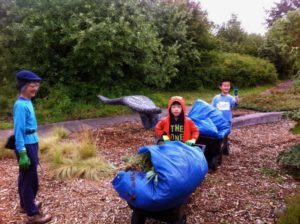 Upon arriving in Seattle, she was excited to find the Children’s Garden, became a committee member in late 2017, and immediately began volunteering at events and nature walks. She is now using her wonderful graphics skills and creative energies to design new signage and educational activities for the garden while working on her Masters in Museology at the UW. Here she is exploring the Olympic Peninsula rainforest!